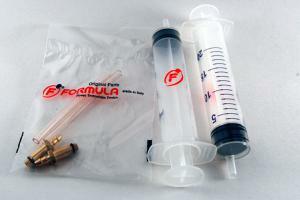 Thread: where to buy bleed fitting for formula k24? does anyone know where i can buy the bleed fittings that are found in the formula bleed kits? i am referring to the small brass (?) pieces that connect the syringe tube into the caliper. in the attached picture they are the 2 pieces in the bottom left. tried an avid kit w/ plastic fittings from ebay and they didn't work for me (o ring size was too big to ensure snug fit). I picked mine up from http://www.cambriabike.com/shopexd.asp?id=39049 for $26. sorry i should clarify. i have syringes, tubing, extra o rings, fresh brake fluid, strap, etc. i am just looking to see if anyone has info on the brass fittings and where to find them. some of the newer kits seem to have 2 different brass fittings whereas the picture i attached seems to have identical pieces. i checked on mcmaster carr and some other websites but i would need to know the dimensions. i can measure the ID on the brakes but it would seem to have little margin for error. i was hoping someone knew the part specs to make it easy on me. Send an email, and Charlie will help you out. You can also use the Avid bleed kit. It's almost identical and works fine.